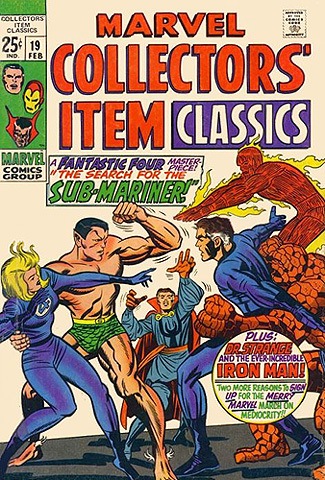 Marvel Collectors' Item Classics #19, from February, 1969. A terrific issue of this thicker-than-usual Marvel title from the 60's, featuring four stories: Joltin' Jack Kirby's artwork in a Fantastic Four tale "The Search for Sub-Mariner" (nobody drew "The Thing" better than Jack! ), a haunting Iron Man story "The Death of Tony Stark" (art by Don Heck), Larry Lieber's Tales of the Watcher "The Primitive" (Lieber was Stan Lee's brother), and a Dr. Strange tale "The Demon's Disciple" drawn by the incredible Steve Ditko of Spiderman fame. Of course, all the stories are penned by Stan Lee, "unchallenged master of the dramatic word"! And, hey, Mr. Pop Top loves those old ads: "Tired of Being Skinny?" with a beefy guy drinking some kind of steroid-laced shake while two lasses, weighed down by their hairspray, hold onto his sinewed arms; how about trying a "Super Smoke Bomb" (five for a dollar...just don't try to board a plane with 'em); a "Darling Pet Monkey" can be stuffed into your mailbox for $18.95; and howzabout Norman Rockwell seated at his easel "looking for people who like to draw" (presumeably to weed them out of society, systematically...one by one). A wonderful journey back in time to planet 1969, now so far away. This copy is in VG-F condition. Magazine size 10 1/2" x 7". Only one in stock.